A clean-up operation around Bristol's Temple Meads railway station has seen 36 tonnes of rubbish cleared and 285 pieces of graffiti removed. More than 50 staff from Network Rail took part in the spring clean around the station on Monday. Tracks and buildings in the Temple Meads area are now a "zero-tolerance" zone in an attempt to cut vandalism. Network Rail says it will work closely with British Transport Police and Bristol City Council to enforce this. 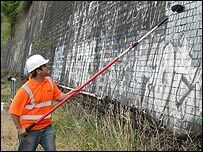 Robbie Burns, Network Rail's Western Route Director, said: "We are determined to tackle graffiti and vandalism on the railway and make sure people know this will not be tolerated. "Any help that members of the public can give us in catching those responsible is welcomed and we urge anyone with information to call the British Transport Police."